Prepare both your eyeballs for a huge surprise. At first glance this photo looks like there is no potato…no potato here at all…but then…you’ll see potato. Once you see potato…you’ll never unsee potato. Potato will be in your eyeballs and in your mind forever…once you notice potato. Here is photo of what seems like no potato. Or is there potato? There is! On shelf! On shelf it hides! 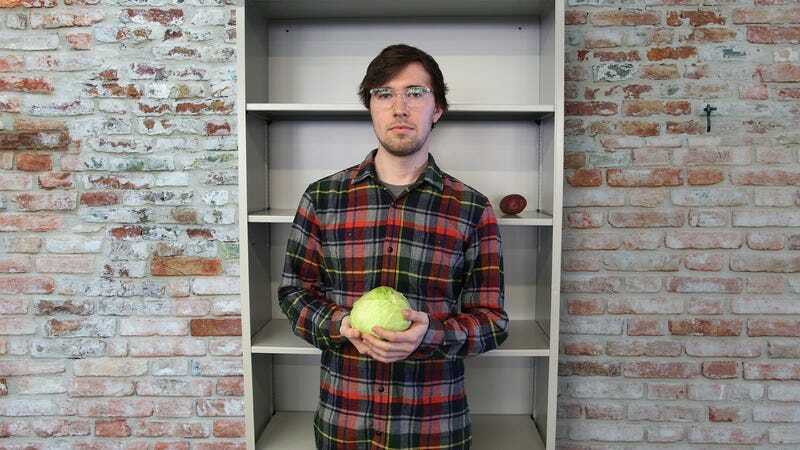 Photo tricked you into thinking it showed man holding cabbage and no potato anywhere, but if you look closer…at shelf…behind man…you will see potato. Potato was here whole time, but you were blind. Blind to potato. Still can’t believe news of potato? Here it is. Here it always was. Now you see. Now you understand. Photo has potato in it…you have seen potato and your eyeballs know the secret. Do not try to forget. Do not try to ignore. It is futile because…you can never go back to how it was…before you noticed potato in photo…and learned potato was on shelf…behind man…you will always see potato forever. Share photo with your friends. Open their eyeballs to truth…of hidden potato…they will be…amazed.